An echosounder is a device designed to send a pulse of sound down to the seabed below. This pulse of sound then reflects back when it encounters the seafloor, or life, such as fish, squids, jellies and krill. The most amazing event we have seen captured by the echosounder is the daily migration of sea life (including fishes). These creatures rise up from depths of 800 metres to the surface to feed at dusk and then return back to the depths at dawn. This is part of the largest daily migration of animals in the world, with estimates of fish biomass alone from one to 20 Giga tonnes. That is five to 100 times more than the weight of all humans on the planet! Closer to the seamounts, approximately 1000 m below the surface, we are observing schools of fish that we are eager to discover more about, specifically their numbers. Orange roughy are of special interest as they have been known to occur here in “feeding aggregations” over the summer period. However, as orange roughy have oil-filled bladders rather than a gas bladder, they have a weak reflection and are difficult to count. 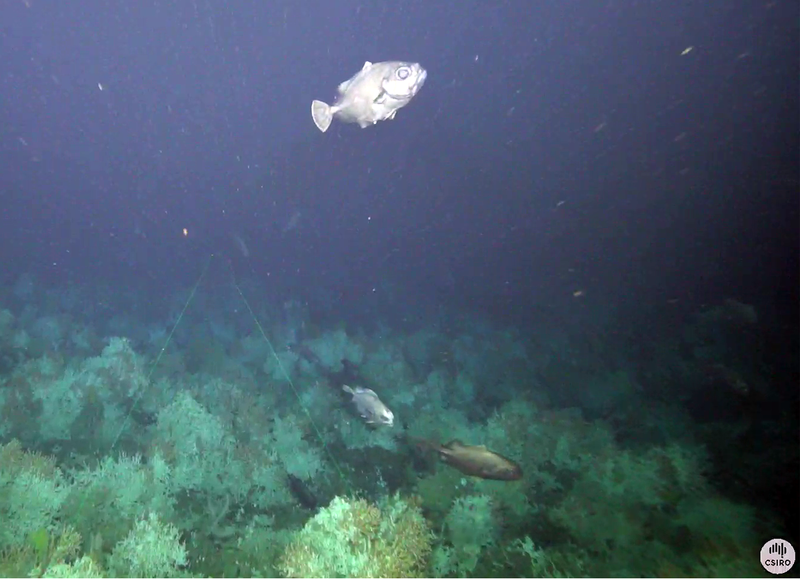 During this trip we have seen many schools of fish on the seamounts. These are more likely to be “oreos”, a species of fish with a gas bladder that scatters sound strongly. This is also supported by the footage we have seen from the towed camera. 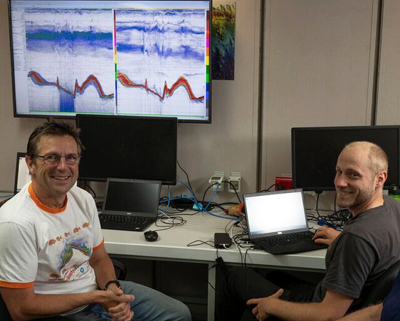 The deep water video footage has been fantastic to watch as it helps us understand the types of life we are sounding. Through the water we are seeing a large array of jelly like organisms. One of our favourites is the top predator fish eating siphonophore. We have seen large (up to two-metre-long) specimens that, due to a large gas float, also scatter sound strongly! 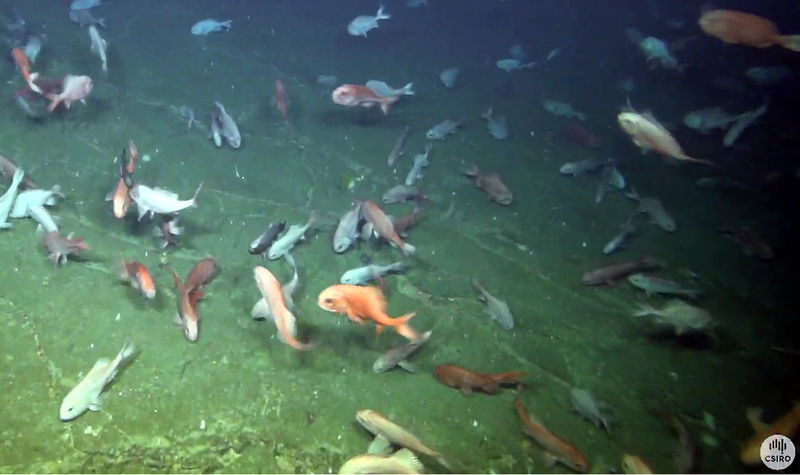 Closer to the seafloor we are seeing the fishes – oreos, orange roughy, whip tails, sharks and eels among others – that help us classify the acoustic records to estimate numbers. To improve our ability to count the fish we have done a unique experiment to calibrate our recordings. This experiment involves lowering a very large gas-filled glass ball off the side of Investigator, deep below the water’s surface. 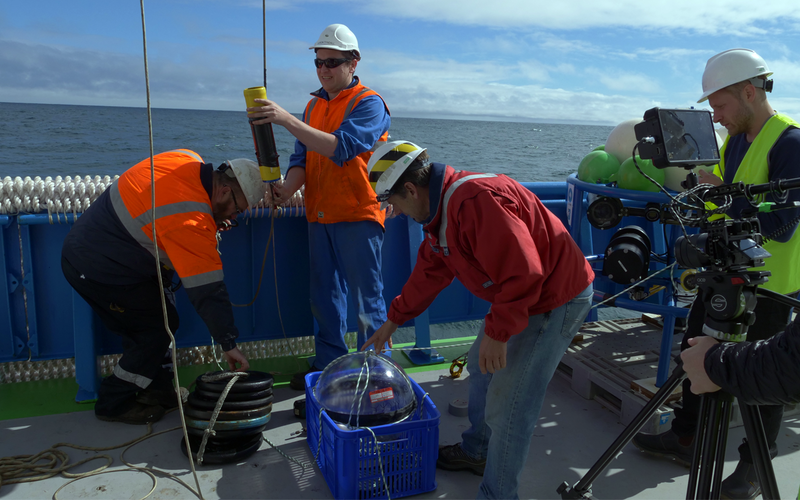 Using sophisticated positioning systems and ship manoeuvrability we have been able to measure the glass ball position and strength up to depths of 1200 m. We are optimistic that this will improve our ability to count fish at longer ranges! With good weather and the towed camera cooperating, we have been focusing on camera transects, with 10 completed today. Transects off the north face of the Sisters seamount were particularly interesting with a yellow stony coral at the top of the seamount down to about 950 metres, and patchy Solenosmilia stony coral below this down to 1200 m, (although it was far more abundant on the top of Little Sisters, at this depth and just to the north). 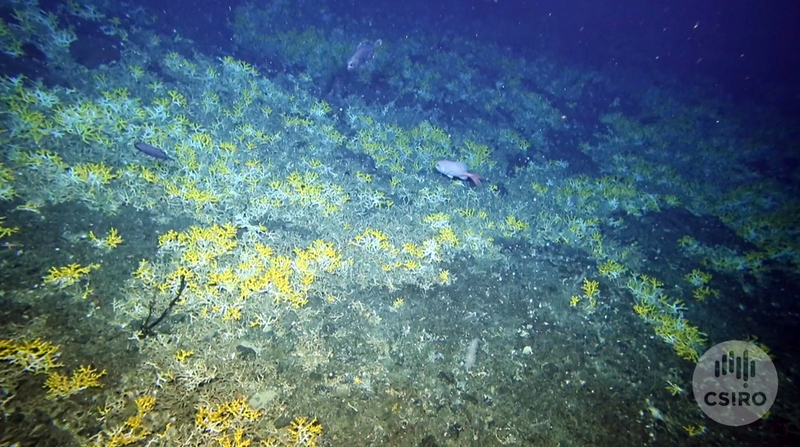 Most surprising was the presence of abundant deepwater coral matrix on the relatively flat undulating seafloor between seamounts. If this pattern is repeated then there is considerably more deepwater coral matrix in the Huon Marine Park than previously thought. The north face of the Sisters is very rough and craggy and is unlikely to have been fished very often, judging by the lost trawl door and several sections of trawl wire observed. Because the acoustic beams used in echosounders spread with depth (similar to a torch beam), by the time they reach 1000 m depth they may cover a substantial area. 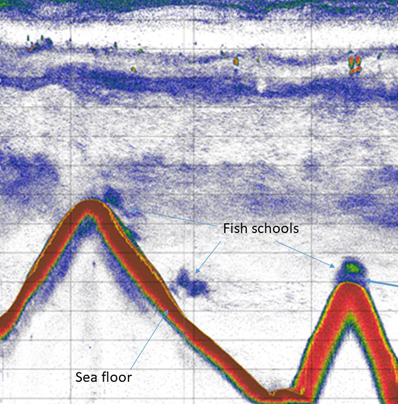 At 1000 m depth, fishers' sounders would have had a footprint of 200 m or more across, scientific sounders 100 m across, and the newer multibeam systems 30 m across. Even with a 30 m footprint, we are unable to see the craggy nature of different seamounts. Using single beam sounders scientists and fishers were unable to see the complexity of the seafloor at these depths, before the camera or trawl hit the bottom. Scientific and fishing gear can get hooked up easily at these depths and is easily lost. An exciting moment in the day was the retrieval of the deep sea Baited Remote Underwater Video System (BRUVS) from the Sisters seamount where it has sat for two days at 900 m depth filming the fish community on alternate hours. The acoustic release was activated at 1:30 and 15 minutes later our ‘eagle-eyed’ voyage leader, Alan Williams, spotted the BRUV as it surfaced 200 m off the port bow. The BRUV was snared with a grapnel and brought on board, and is in the process of being downloaded.